An online safeguarding course developed specifically for the Designated Safeguarding Lead Person and Deputy who have already completed an Introduction course. This safeguarding course builds upon previous knowledge, including processes and procedures, legislation, agencies, handling allegations and making referrals. I have been very impressed with the courses provided by the Child Protection Company. I needed to provide training to a large number of primary school staff and your online courses were an efficient and effective way of doing this. I was able to track and monitor individual staff progress through to completion of each course. I was also able to provide detailed information to Ofsted during our inspection and received very positive feedback. I would not hesitate to recommend your company and will certainly use you again to meet future training needs. I found the course very easy to understand. As I have followed the topics I have printed off the policies and I will keep them all together in my folder and make sure all staff know where to find them. The course has given me all the tools needed to confidently lead in the DSP role and I have learnt so much more than I was aware of previously. Does this safeguarding course qualify me to become the Designated Safeguarding Lead Person? No. This safeguarding course builds on existing knowledge gained from our Introduction to Child Protection online training course. The Designated Safeguarding Lead Person (DSL) and Deputy for your organisation must complete both the Introduction and Further Child Protection courses. Note: We recommend that Designated Safeguarding Leads and Deputies working in education check with their appropriate Local Safeguarding Children Board (LSCB)/Safeguarding Partners/Child Protection Committee/Safeguarding Board of Northern Ireland prior to taking this safeguarding course, as some local authorities insist that the DSL and Deputy take the local authority's own face-to-face training. Is this a Level 3 safeguarding training course? No - we do not offer any Level 3 face-to-face or online safeguarding training. The reference to levels within safeguarding training was dropped some years ago, however, for healthcare professionals, this course is in line with Level 2 of the Intercollegiate Document. The Intercollegiate Document states that Level 3 safeguarding training should be undertaken in a face-to-face environment, therefore, you should contact your relevant Local Safeguarding Children Board (LSCB)/Safeguarding Partners/Child Protection Committee/Safeguarding Board for Northern Ireland to find out when they are next delivering multi-agency Level 3 safeguarding training. Is this course suitable for people who do not work in a school? Yes, this safeguarding course builds upon existing knowledge gained from our Introduction to Child Protection online training course and offers Further safeguarding training to anybody who comes into contact with children or young people during work, voluntary or leisure activities. Provides information and downloads specific to a range of different sectors including education staff and sports coaches. A specific Dental version of the course can be selected at the start of the training. This course is an online child protection training course specifically developed for the Designated Safeguarding Lead Person and Deputy or equivalent who have already completed an Introduction to Child Protection course. Within the course, there are specific learning tracks for Dentists/Dental staff. There are also specific tracks for learners based in Scotland, Wales and Northern Ireland. You can choose the most appropriate route at the start of the course. This module will give you an overview of the responsibilities of the Designated Safeguarding Lead Person and the prerequisites needed to undertake the role. By the end of the module, you will understand what qualities and skills are required to be a successful Designated Safeguarding Lead and the requirements for taking up the role. This module will act as a refresher and building stage for your existing introduction to child protection training. 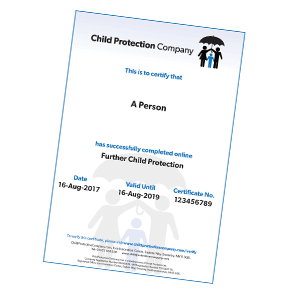 It is important that you have refreshed your previous learning so you are ready to apply your basic child protection awareness to the modules that follow. By the end of this module, you will have refreshed your knowledge of the different kinds of abuse you may encounter and the signs that could indicate a child or young person has fallen victim to them. We will have also reminded you of some of the myths surrounding child abuse and the importance of remaining child-focused. As well as informing you of the legal framework, this module will discuss relevant guidance and assessments, which were designed to enable people to recognise where support may be needed. By the end of the module, you will be able to understand the relationship between the guidance and the law, and your role within the child protection process. The Designated Safeguarding Lead Person is pivotal in maintaining an effective child protection process and a culture of safeguarding within an organisation. This module is key to understanding the function of the Designated Safeguarding Lead Person and the importance of the role. By the end of this module, you will have a better understanding how to act as central contact for safeguarding, your role in compiling or creating policy, and when and where to seek advice and guidance if needed. One of the areas that the DSL and DDSL role will cover is the encouragement and maintenance of good lines of communication. Child protection and safeguarding is much more effective when barriers to communication are removed, opportunities for disclosure are available, and interdepartmental contact is maximised. By the end of this module, you will better understand the need for clear communication, the importance of safe information sharing and the role played by the DSL or DDSL in creating a culture of communication. The role of the DSL/DDSL will often require that they act as a pivotal point of contact for a variety of agencies. Understanding of the roles of these agencies and the tools that they use will facilitate a fast, appropriate and effective response to a situation. By the end of this module, you will understand the role of the Local Safeguarding Children Board (LSCB)/Safeguarding Partners/ Child Protection Committee/SBNI and how the various statutory and other agencies should work effectively together to safeguard and promote the welfare of children. It is the right of families experiencing the safeguarding or child protection process to make a complaint if they feel the need. All complaints should be given equal attention, and part of the role of the DSL/DDSL is to ensure that the policy for dealing with complaints is appropriate and fair. By the end of this module, you will have a greater understanding of the process for complaints, who should be involved, and how to progress a complaint or allegation in the right way. This part of the training will assess how well you have understood the content of your course, by asking a series of questions about what you have learned.